This article explains the types of videos you can embed in proposals, tips on how to create those videos, and how to embed them. Personalized video is proven to decrease time to close and increase closing ratios. Portal allows you to embed videos directly in your proposals, transforming your proposal into the ultimate closing tool! Our resident video expert, Reed, also recorded a tutorial video that goes over everything you need to know to start creating your own videos. Of these, the most impactful video is the Project Description, as it allows you a place to insert a video personalized to your client, where as the About Us page will be an evergreen, or reusable, video for all your proposals. To get the most out of video and increase your closing ratios, record a personalized video for every proposal you send. But wait, doesn't video take hours to prepare, record, and edit? Sure, but you'd be doing it wrong. Let's go over the method on how to get your total production time down to 10 minutes or less, allowing you to produce and embed videos in your proposals without sinking hours into the process. Your video should come across as regular conversation. You don't want to write a script, because that seems rehearsed and impersonal. Instead, practice a technique called Scriptless Scripting: outline your key points using one or two-word bullet points, and record your video while improvising off of those points. If you need to glance at your paper with your one or two-word bullet points, feel free - the video doesn't need to be perfect. In fact, embrace your mistakes and when you stumble over a word - you're not making a multi-million dollar marketing piece, you're making a personal video to a prospect. If that's too hard to swallow, think about this: what do you do when leaving a voicemail? You don't practice what you're going to say before calling, you just have a general idea of your message and riff off of that. Simple! A video should be the same. Don't dress up for your videos. You should look presentable, but don't put on clothing you wouldn't normally wear to the jobsite - your client will get the impression that you're putting on a front. Tidy up the office a little bit, sure, but don't worry if your office looks like... an office! It should! Can you pick up on the theme here? Be genuine in your videos, and you'll be much more successful. If your background is a blank wall, then you might want to put a few pictures up to break up the monotony. If you watched my tutorial video above, you'll see how Reed is sitting during the video. Frame yourself using the rule of thirds, don't put yourself right in the middle of the frame. Too many people do this, because they don't know any better. A good way to remember this is to think about having a conversation with someone at work. If you're sitting directly across from them while at your desk, looking straight into their eyes, it can come off as aggressive, even if the conversation is anything but. Rather, sit to the side, relax, and have an open conversation. Also, be sure to put your camera on a tripod and have it at eye level. There's nothing more amateur than using the laptop camera and looking up your nostrils or down at the top of your head, depending on if the camera is too high or too low. If applicable, (perhaps in a video where you're explaining a particular item that's being installed in a room), have that item in your hands so the customer can see what you're talking about. We want this video to be one take. In the beginning, don't expect to get it perfect, but as you practice and record more and more videos, you'll only need one take! Be genuine! Be personable! It'll come across on camera quite clearly if you're not. Stand: Either a tripod or a light stand. Lighting: Either a ring light (Diva Supernova is great) or bright ambient light. Microphone: Any high quality microphone like a Rode NT-USB or a Yeti. Don't use your built-in microphone or the microphone that comes on the webcam, as the quality is poor. So we've got our equipment, but what software do we use to capture the video? Honestly, anything will work! If you're on a Windows (and using a Logitech camera) I recommend downloading their recording software directly from their website. If you're on a Mac, use Quicktime (which comes built into your computer). Additional instructions for Quicktime: Open it up and click File>New Movie Recording. Then, select the proper webcam and microphone from the drop down menu next to the record button (see image below). 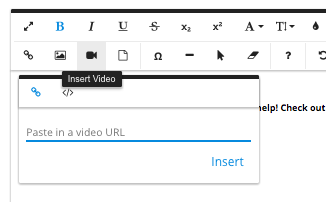 After recording your video, if you want to trim the beginning or end, click Edit>Trim. I don't recommend using editing software, as it adds unnecessary time to the production process. Instead of editing, make sure you have good lighting, proper mic sensitivity, and have used Scriptless Scripting to outline your key points before recording the video. A little preparation goes a long way, and eliminates the need for editing! If you need help with any of these features, contact our Dealer Happiness team using our live chat. That's about it! If you haven't already, please watch the tutorial video in which I go over all these items and illustrate each principle.